Mcfadden sign’s early.That’s GOOD isnt it… SO GOOD it’s GREAT! 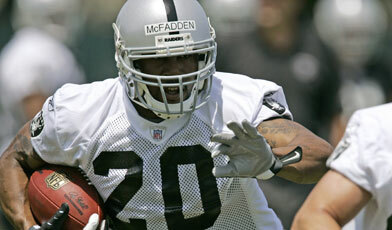 Mcfadden is now a Oakland Raider! ~ by Rod on June 9, 2008. The Greatness of the Raiders is returning!!!!!!!!! This guy is a beast!!!! The Raiders will dominate again. This entry was posted on June 9, 2008 at 6:00 pm and is filed under Players.You can follow any responses to this entry through the RSS 2.0 feed.You can leave a response, or trackback from your own site.